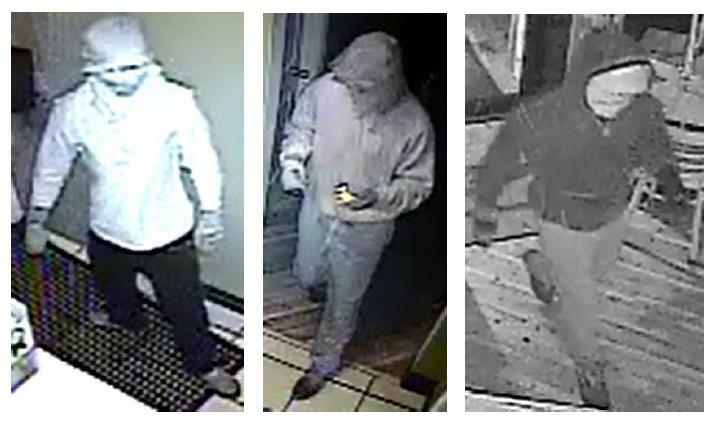 COCOA BEACH, Florida - The Brevard County Sheriff’s Office is seeking the public's help to identify suspects responsible for the burglary of The Fat Snook restaurant in Cocoa Beach, Florida. On Wednesday, May 18, 2016, at approximately 2 a.m., three masked suspects wearing hooded sweatshirts and gloves broke into the Fat Snook restaurant located at 2464 South Atlantic Avenue in unincorporated Cocoa Beach. Surveillance video shows the burglars smashing through the front door of the restaurant and rummaging through office desks in search of anything of value to steal. Sheriff’s agents are asking anyone with information about this burglary or the identity of the suspects, to please call Brevard County Sheriff’s Office South Precinct General Crimes Agent Jason West at 321-253-6683, or CRIMELINE at 1- 800-423-TIPS (8477), you can also visit http://crimeline.org/, or text ‘crimeline’ plus your tip to CRIME (274637). All information to CRIMELINE is confidential and you may be eligible for a reward.